While the cake is cooling after baking, make the frosting by creaming together all ingredients until smooth and fluffy. Melt a small amount of the candy coating in a glass measuring cup in the microwave. Dip the end of each lollipop stick into the melted coating, then immediately into a cake ball, inserting about halfway into the ball. 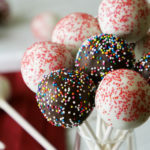 Repeat until all cake balls are skewered with lollipop sticks, then place in the freezer for about 30 minutes. Remove the prepared balls from the freezer and dip / roll each pop, one at a time, into the melted candy coating. Allow any excess candy coating to drip off. Immediately top with desired sprinkles, and place upright into a styrofoam block until the candy coating has set completely. Repeat with the remaining cake pops. Once dried, the cake pops can be easily handled and/or placed in individual wrappers. Thanks to the candy coating, they keep well for several days without going stale. Our chocolate cake recipes are naturally very moist. If substituting your own favorite chocolate cake recipe, you may need to increase the amount of frosting if your cake is drier.